Thrash is a grey wolf, with light grey forearms, light grey legs below his knees, and light grey paws, with black pawpads. His 'hair' is a simple fur tuft. The tips of his ears are a light grey, and he has blue eyes. He has a slightly bigger, fluffier tail than most wolves would, and he always wears his goggles, which have a radioactive design on them. He is usually plantigrade, but can be drawn digitgrade if your art style requires it. You can draw Thrash any way you like, I don't mind how you use him, so long as the art's clean. 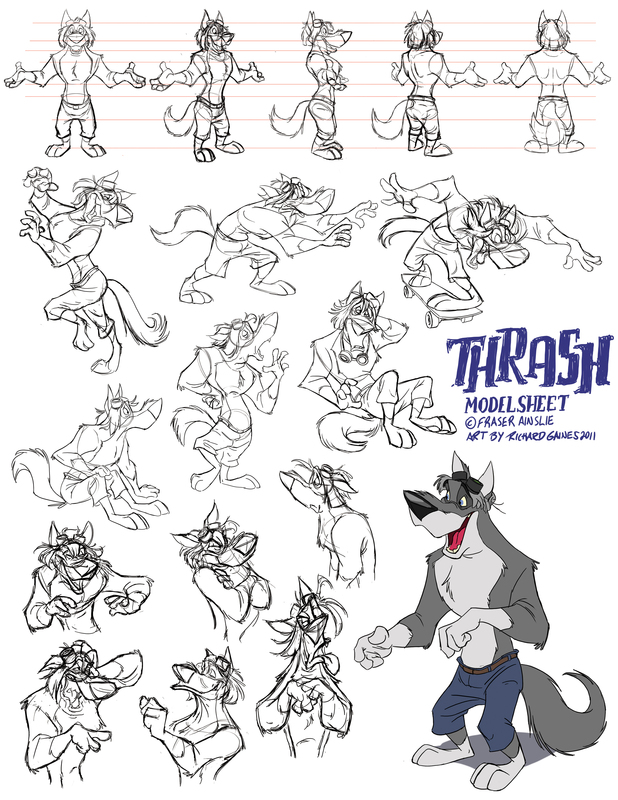 While Thrash is in a toony style in this model sheet, he can be depicted in a variety of styles, see my main gallery for examples of this. If you need me to clarify anything, or need to get in touch with me for any other reason, you can reach me by either sending an email to thrashwolf@hotmail.co.uk, or contacting me on here (I would prefer an email). As above, however, Thrash's 'hair' is a fur tuft, not long hair as seen in the reference. Thrash generally goes au natural, but can be seen wearing trousers (pants), or sometimes protective gear, if the commission requires it. Thrash is almost never seen without his goggles, and rarely without a black dog-collar. His collar is plain black, and does not have a name tag or anything else attached. His goggle design is linked above. An awesome character sheet by SuperStinkWarrior. The hair was too long for my liking in the original, so I took the liberty of editing the coloured character's hair-length to something a bit shorter. The original version can be found in my scraps.